Don’t wake up in pain just because you haven’t found the right pillow. 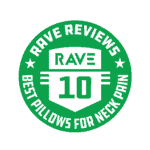 The team here at RAVE has put together a list of the best pillows for neck pain that we could find. And hands down, our top winner is the Ultra-Luxury Bamboo by Snuggle-Pedic. 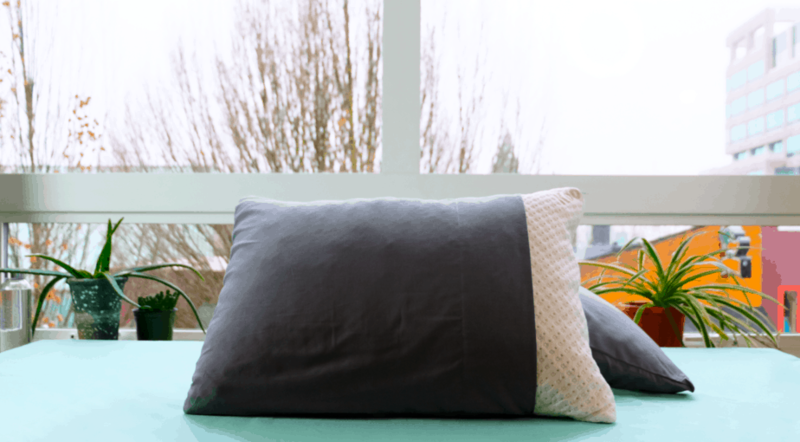 Whether you sleep on your stomach, side, or back, this pillow doesn’t discriminate — it’s got the perfect amount of support to alleviate stubborn neck pain. If you want to ease your neck pain, your pillow is the place to start. The key is finding a pillow that provides your neck with the support it needs. But how much support do you need, anyway? The answer will vary based on your body shape, preferred sleeping position, and whether there’s another injury or condition that’s affecting your neck, back, or spine. It only gets more confusing when you consider the huge variety of pillows available on the market. Do you go with shredded memory foam or gel fiber? Contoured or standard? Do you need an adjustable loft? 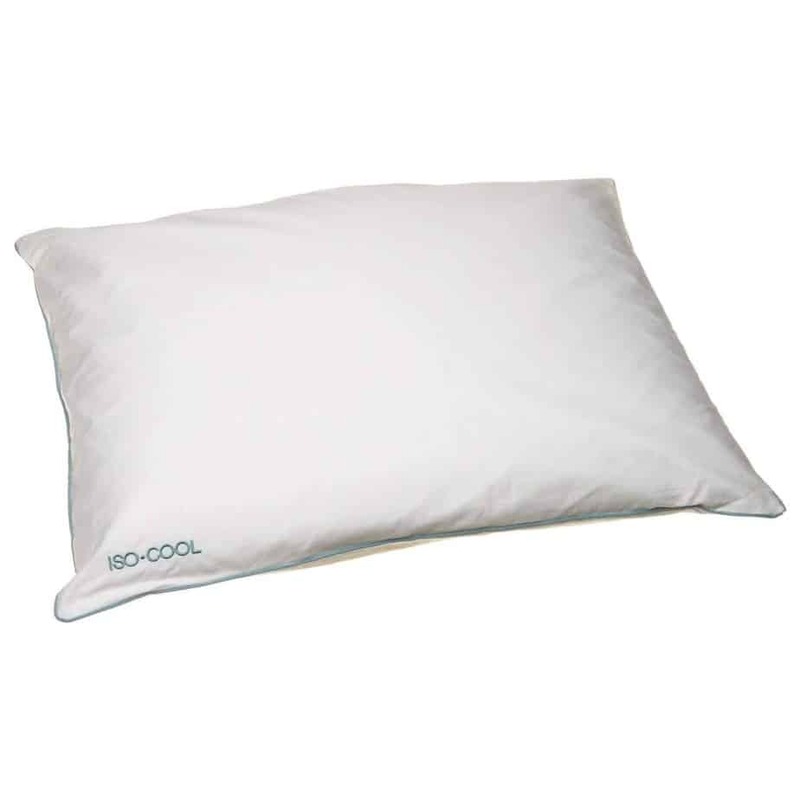 What about cooling pillows, hypoallergenic pillows, eco-friendly pillows? Don’t worry — you’re in the right place to get your questions answered. We created this ranking to help you find the perfect pillow for you. Send your neck pain to bed with these top-ranked pillows. A must-have for those who suffer from serious neck pain, the Ultra-Luxury Bamboo Pillow by Snuggle-Pedic is snuggly like a down pillow, with support that never goes flat. It’s perfect for stomach, side, and back sleepers. The Sleep Innovations Contour Pillow is one of those rare things in life that comes at a fraction of the price it’s worth. If you’re on a tight budget, this is the pillow for you. Believe it or not, some pillows actually contain environmentally toxic chemicals. These chemicals can disrupt hormones and cause a spike in allergy-related symptoms. Sleep easy with the Ultra-Luxury Bamboo Pillow by Snuggle-Pedic, which is our best overall pillow for neck pain as well as the best eco-friendly pillow of the lot. The average person needs about 8 hours of sleep per night. Our bodies are designed to compensate for less sleep than this here and there, but in the long run, we need adequate sleep or our health will suffer. According to the documentary Sleepless in America, 40 percent of Americans are sleep deprived, with many getting less than 5 hours of sleep per night. So, what does this mean? Not getting enough sleep on a regular basis means that, first and foremost, your physical health is at risk. Those who don’t get enough sleep are likely to get sick more often and to take longer to heal from injuries. And, since limited sleep means limited ability to focus, you may see a drop in your work performance and productivity. Sleep deprivation can also have a huge impact on your day-to-day mood and your overall mental health. We even affect those around us by not getting enough sleep. Our romantic, platonic, and professional relationships are likely to be under strain when we’re not feeling our best due to constant lack of sleep. What’s the root cause of all this missing sleep? Maybe it’s because we’re on our phones and laptops too close to bedtime. Maybe we just have too much on our plates, and the stress of it all is what’s preventing us from getting enough shut-eye. Or, maybe it’s much simpler than that. Like, say, what we’re sleeping on. This issue of not getting enough sleep may really just come down to the fact that we’re not getting enough comfortable sleep. The fault may simply be in our pillows! Believe it or not, you can get your full 8 hours of sleep and still not feel fully rested. This is most likely because the sleep you’re getting isn’t restful — it’s uncomfortable and filled with tossing and turning, constantly fluffing and flipping over your pillow. The net result is you waking up the next morning feeling groggy and sore. If your pillow isn’t doing its job, you may as well not be resting at all. And that’s not even all of it! As you can see, it’s important that you really take the time to choose which pillow is the best for your needs. We care about your health, and we care about your sleep. We want you to wake up each morning feeling refreshed and ready to take on the world. In this guide, we’re sharing with you what we truly feel are the top 10 best pillows for neck pain. Take a look at these 10 pillows, choose the one that works best for you, and say goodbye to long nights of restless, uncomfortable, painful sleep. With all these considerations in mind, we’re sure you’ll find a pillow that’s perfectly suited to your needs. Take a look at our picks of the best pillows for neck pain and find a match made in pillow heaven. 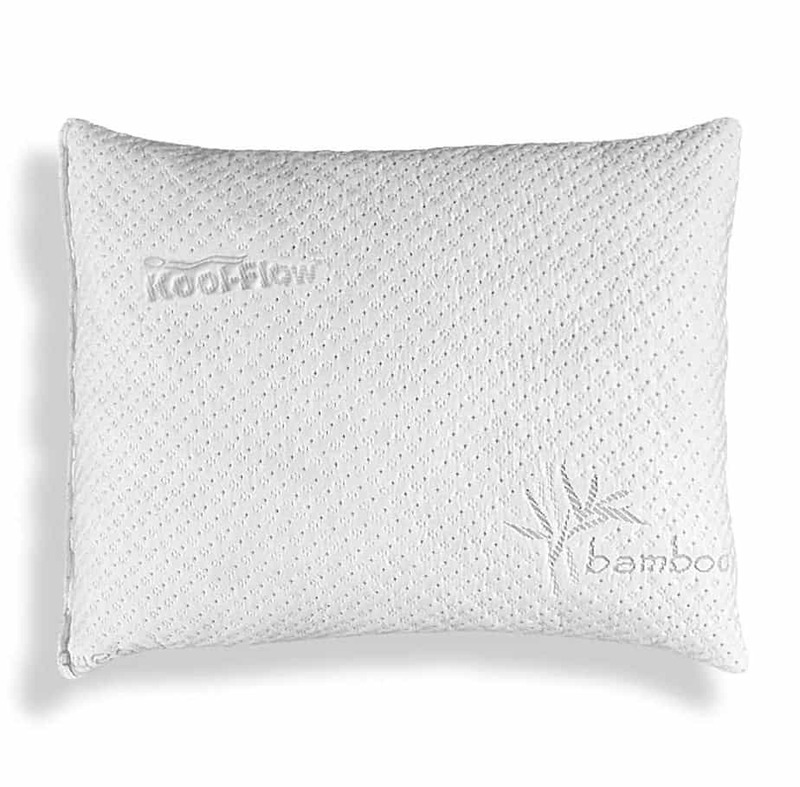 Ranked as our best pillow for neck pain and the best eco-friendly pillow on the list, the Ultra-Luxury Bamboo Pillow by Snuggle-Pedic features a Special Cool Flow bamboo design, with microvents in the fibers of the cover to help prevent heat build-up. But that’s just a glimpse of what this pillow has to offer. It is also a US CertiPUR-certified foam product, with Biogreen certifications for its eco-friendly design. The Cool Flow micro-vented cover, along with uniquely crafted interlocked micro-fiber fill, ensures that you remain comfortable all night long. Another ingenious feature of this pillow is that it is one of the few products out there that caters to all types of sleepers. This is a result of its customizable design: The fill is adjustable, so you can get the right density and ideal loft whether you sleep on your stomach, side, or back. Thanks to its extreme versatility and unmatched comfort, the Ultra-Luxury Bamboo Pillow is an easy choice for the number one slot. The first of many things that we love about the Coop Home Goods Original Pillow is that the material is certified by CertiPUR-US, meaning you can rest easy knowing that your pillow is free of potentially dangerous chemicals and other harmful substances. Most importantly for this ranking, though, is that this pillow can work wonders for those struggling with neck pain every morning. The pillow features a cross-cut microfiber blend for the fill, which provides your neck with the support it needs without making it feel as if you are sleeping on bricks. We also love its signature cooling technology and hypoallergenic properties. That means no more sweating it out or sniffing it all up. 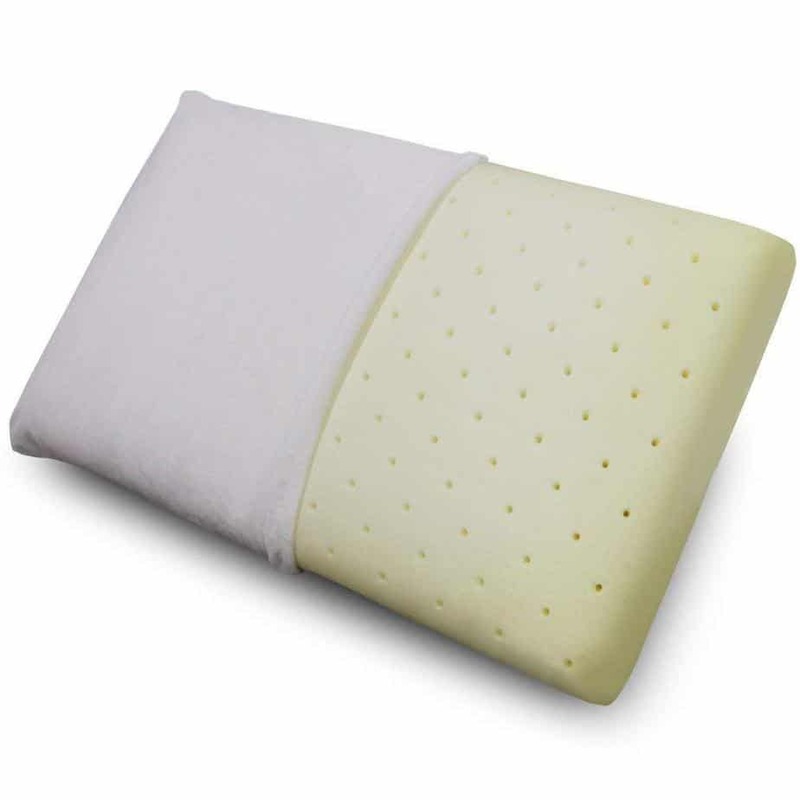 Tons of happy customers have found that the Sleep Innovations Contour Memory Foam Pillow allows them to sleep more deeply and wake up with less pain and stiffness. The pillow’s therapeutic design and contoured shape adapts to the head, neck, and shoulders to provide enhanced support, all without sacrificing comfort. This pillow allows you to choose between a higher contour or lower contour, depending on which is more comfortable for your preferred sleeping position. It’s proudly made in the USA and is guaranteed to always hold its shape. On the off-chance that this pillow doesn’t perform the way you’d like it to, a 5-year warranty has got you covered. It’s worth noting that this pillow is better suited to back and side sleepers than stomach sleepers. Because it’s less versatile than our 2 previous winners, it drops down to the third-place slot. You’ve heard of a water bed, but have you heard of a water pillow? If not, we’d like to introduce you to the Mediflow Waterbase, a water pillow that’s earned a solid reputation for significantly reducing neck pain. 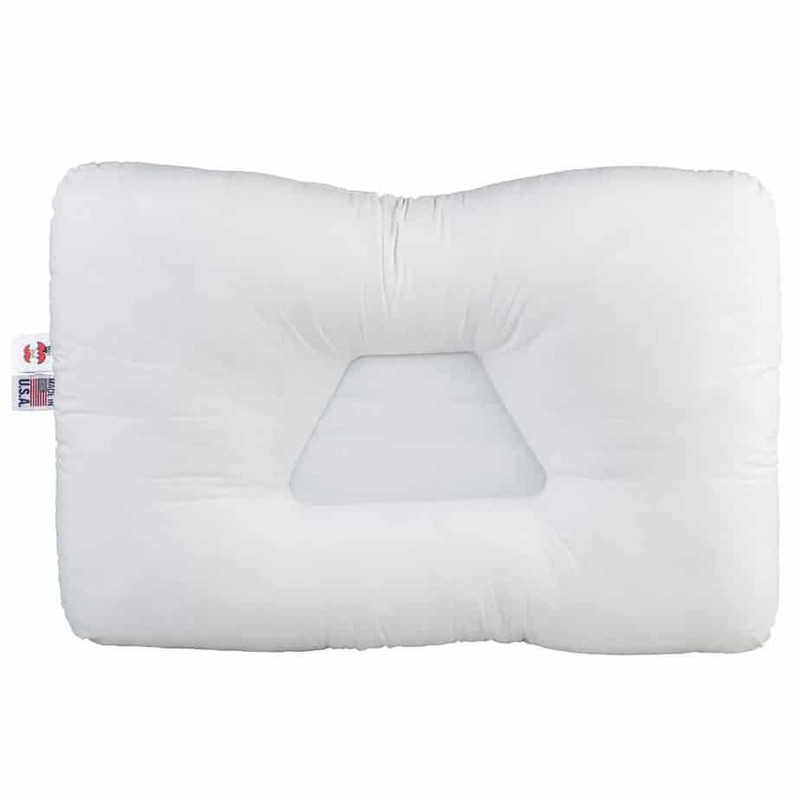 Fully adjustable depending on how much water you add, this pillow provides the perfect level of support for your needs. You won’t have to worry about waking up multiple times each night to get the right amount of fluff — this pillow maintains the support and comfort you need by adjusting to your head motions. It was even tested at the Johns Hopkins School of Medicine, and was proven effective for improved quality of sleep! A 30-day satisfaction guarantee ensures you have the opportunity to test this pillow out before committing to it — though we don’t suspect you’ll find much not to like. It only fell to fourth place because of some concerns about the stitching quality and the possibility of leaks causing mold (ew). But if you take the chance, you could be rewarded with greatly reduced neck pain. Okay, so we’re shaking things up a bit. This isn’t your standard bedroom pillow — it’s a travel pillow. But if you’ve ever tried to nap on a plane, you know that neck pain is practically a guarantee. Enter the Crafty World Travel Pillow. 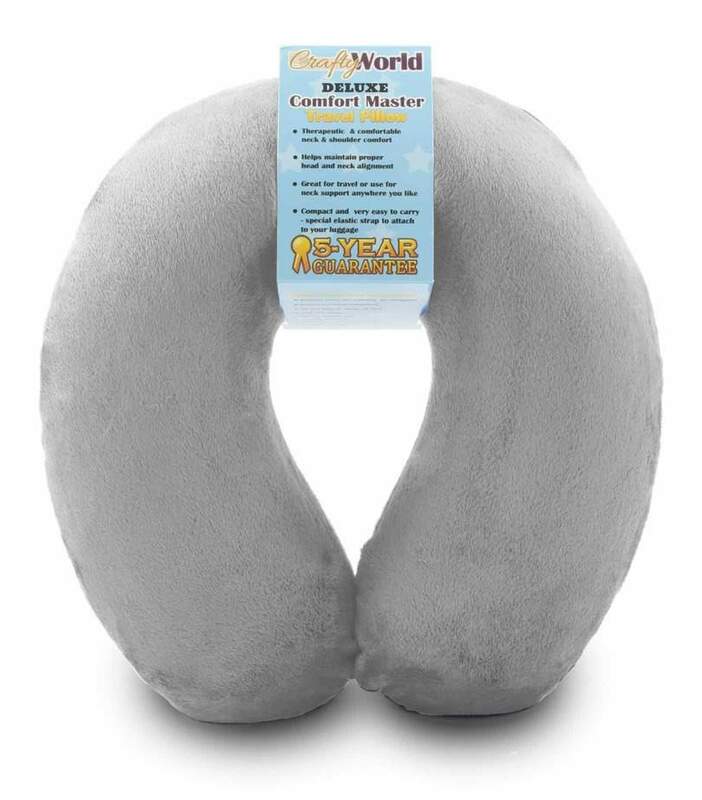 Made from high-quality memory foam that molds to your neck, this travel pillow will have you forgetting what it was like to end your road trip or plane ride with a stiff neck. The Crafty World pillow helps maintain proper head and neck alignment while being compact and easy to carry. It’s durable, lightweight, and comes with a removable, washable cover. Not only is this pillow great for traveling — it can also be used for relaxing at home or getting comfortable in the office. And, on the slim chance you don’t fall in love, you’re offered a lifetime manufacturer guarantee. The highly rated Tri-Core Cervical Pillow is prized for its ability to help alleviate neck pain and correctly align the spine while supporting the neck in its natural position. What does this mean for you? A full and restful night of sleep. 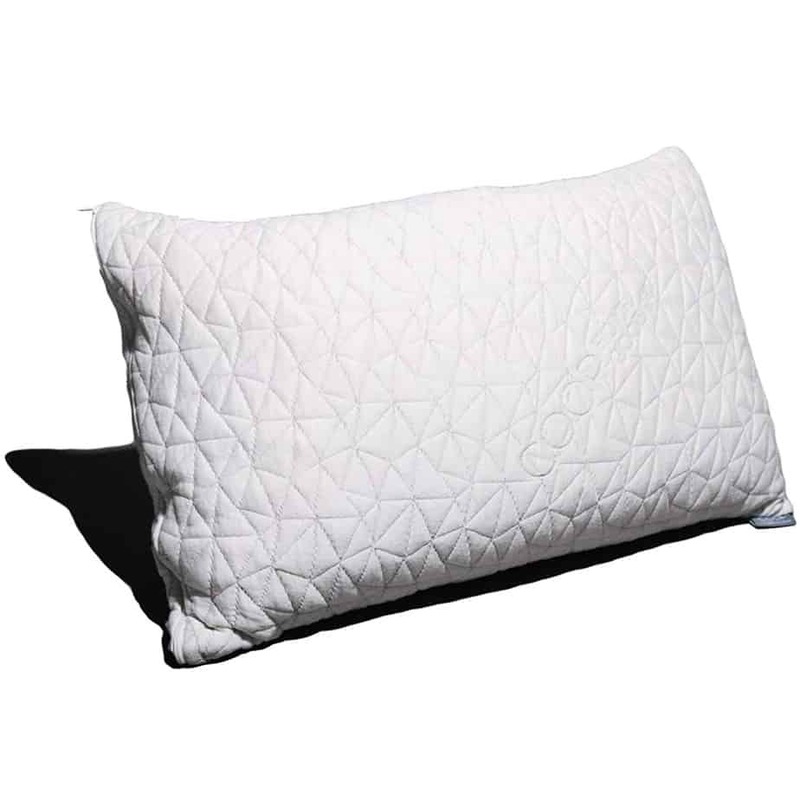 The pillow’s trapezoid-shaped center delivers great orthopedic benefits by cradling the head. Its 2 neck rolls on the top and bottom are different widths, providing a custom fit for differently sized sleepers. The high-resiliency fiber springs back after being compressed, and most customers were thrilled with the pillow’s exceptional comfort. If you don’t like to sleep on your back, this might not be the right choice for you. But if you’re a natural back sleeper or are willing to try it for the sake of your neck pain, you’ll definitely want to give this pillow a chance. 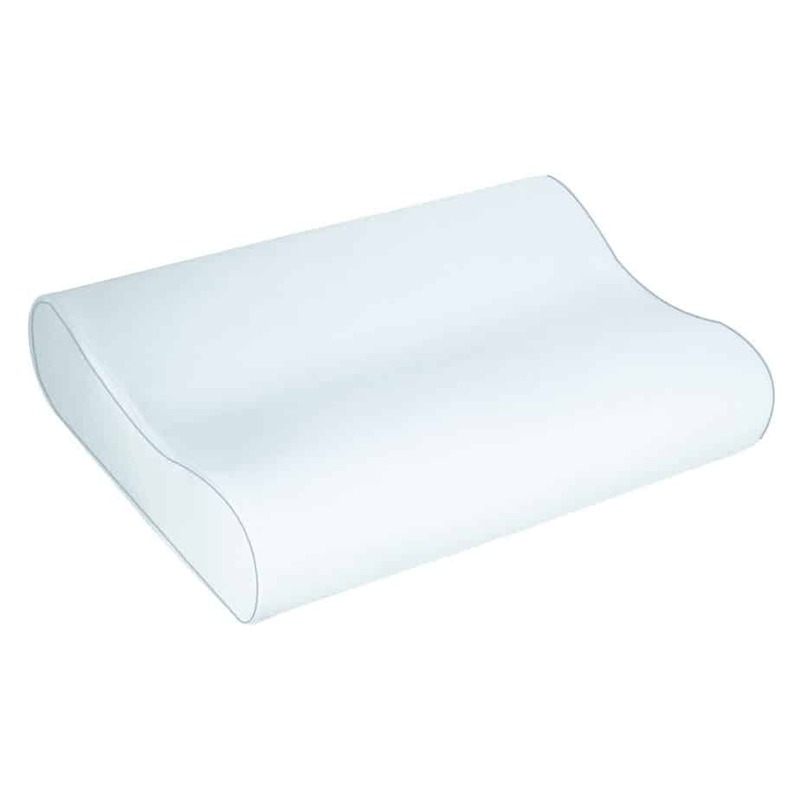 The Conforma Memory Foam Pillow is made from premium memory foam that cradles the head and neck in proper position. The memory foam is also ventilated to promote airflow, which is a huge plus if you tend to sleep hot. This pillow has a medium to firm feel. It’s naturally antimicrobial and resistant to allergens, mold, bacteria, and dust mites. 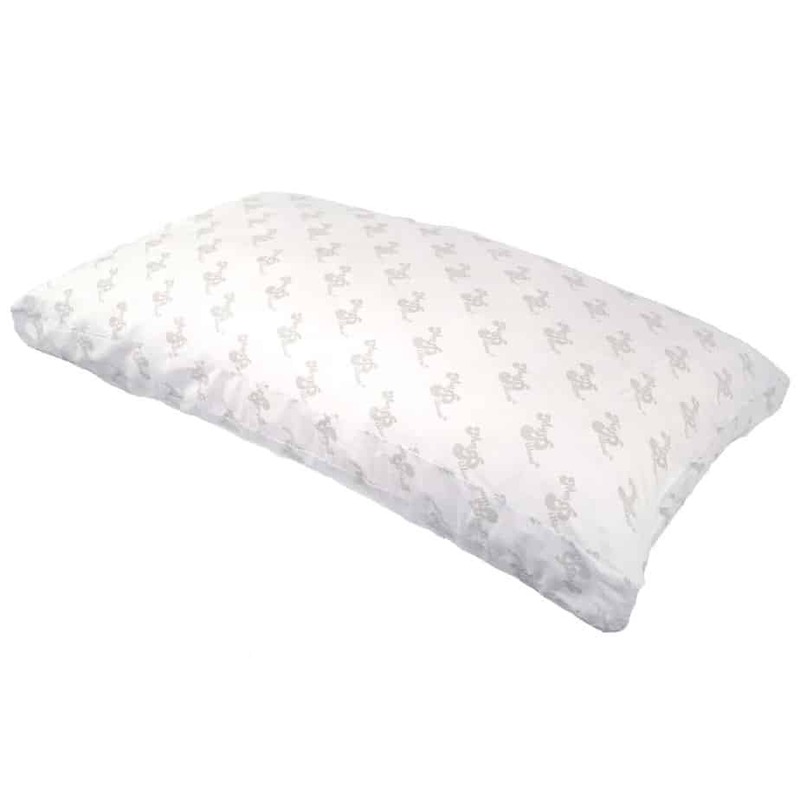 It also includes a soft and removable velour cover, making it super easy to wash this pillow when needed. While this is a terrific pillow in almost all respects, it falls to seventh place because of a few concerns — namely, a noticeable unpleasant odor when the pillow first arrives. It’s also not ideal for stomach sleepers, so it’s not quite as versatile as some of the pillows further up the list. Made with patented interlocking fill, the MyPillow Premium offers a ton of options to ensure that you’re getting exactly what you need in your pillow. If you’ve had problems with one-size-fits-all pillows before, this could be the solution. This pillow is totally machine washable and dryable, so there’s no need to worry about not being able to clean your pillow properly. It even includes a 10-year warranty and a 60-day money-back guarantee, just in case anything doesn’t meet your expectations. This pillow comes in 4 different loft levels — choose between least firm, regular fill, more fill, or firm. It’s also available in 4 sizes, which correspond to your t-shirt size. While we love the customizability of this pillow, there are some reports that the fill can be rather lumpy, especially when the pillow is new. The Xtreme Comfort Shredded Memory Foam Pillow is one of our favorites as it’s fully adjustable, allowing you to choose the thickness and loft that works for you. It’s ideal for all sleeping positions, whether you’re a side, back, or stomach sleeper. Thanks to its premium-quality, CertiPUR-US Certified shredded memory foam, this pillow is the ideal firmness for reducing neck pain. It does an excellent job of contouring to the shape of your neck and head. We absolutely love its bamboo cover, which offers some of the best cooling technology on the market. There are some indications that the pillow will flatten after extended use, which brings up concerns about its durability. Still, while it lasts, this is one of the best pillows we’ve found for a combination of neck support and temperature management. The Sleep Better Iso-Cool Memory Foam Bed Pillow rounds out our list of the best pillows for neck pain. Visco-elastic memory foam filling is designed to maximize comfort for side sleepers — so while it’s not the most versatile in terms of sleeping positions, it’s just as good for side sleepers as anything you can buy. 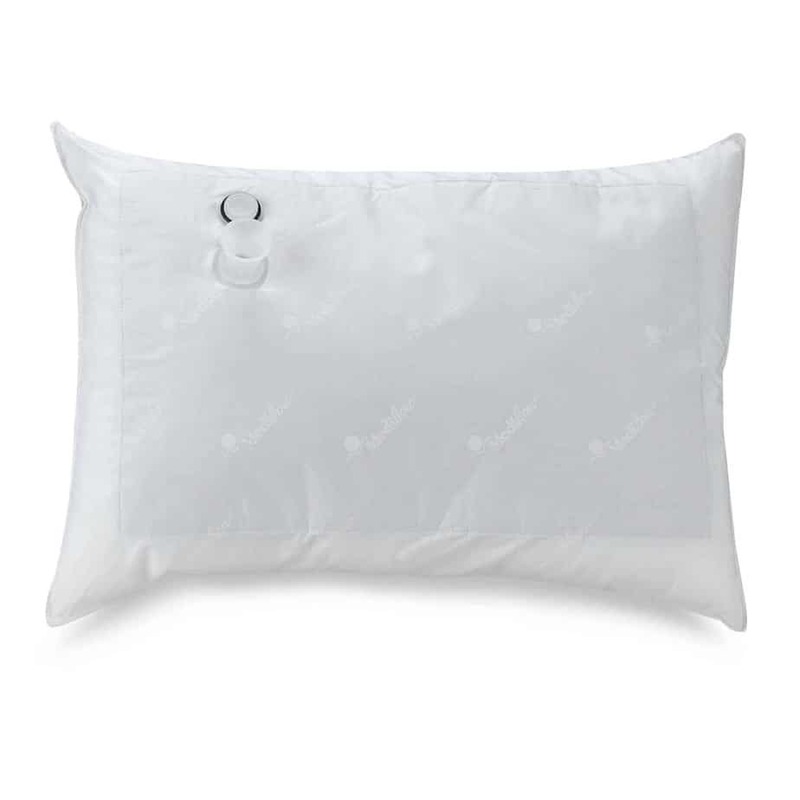 Featuring a 100% cotton cover, this pillow’s fill has microscopic PCM beads that absorb heat to feel cool, or release heat to feel warm, depending on your body temperature. All this helps to regulate your body temperature through the night and ensure you sleep comfortably. 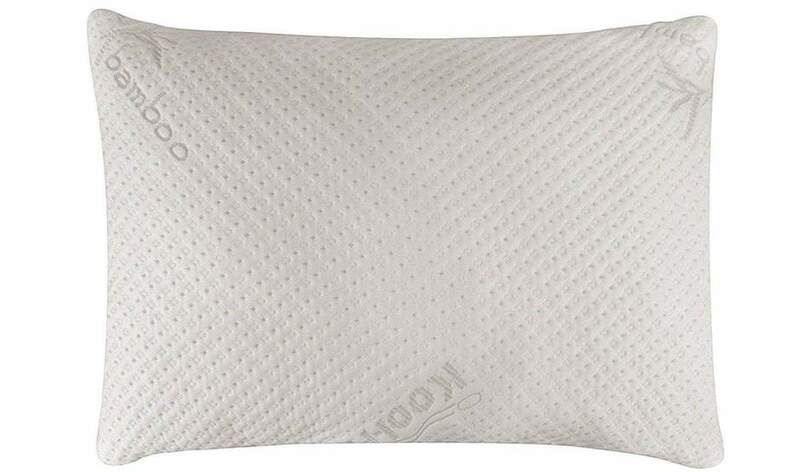 The removable cover is machine washable, which makes it super easy to care for this pillow and keep it in good shape. If you’re a side sleeper who’s had enough with chronic neck pain, you’ll definitely want to give this pillow a shot. If you are reading this, you already know all about that unpleasant stabbing pain first thing in the morning. But have you ever stopped to think about what’s actually causing your neck to flare up? Your neck is made up of vertebrae that extend right from your upper torso to your skull. There are also cervical disks to help absorb shock between the bones. Any type of infection, abnormality, or injury to these bones or disks can cause neck pain. But the majority of the time, neck pain isn’t due to injury or infection — it’s usually improper posture or overuse. Whatever the root cause, neck or back pain can be exacerbated if you’re not sleeping on a pillow that offers enough support. 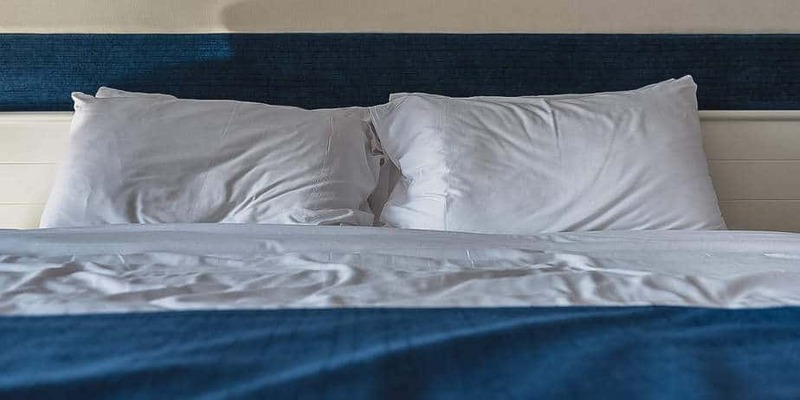 The right pillow will ensure that your spine is properly aligned while you sleep — which will have a huge impact on how much pain you feel the next morning. Can pillows cause neck pain? Your neck is most comfortable when it is aligned with your spine in a neutral position. If your pillow isn’t supportive enough, your neck will be hyperextended as long as it remains out of alignment with your spine. And if you’re in the same awkward position the entire night, neck pain will strike hard first thing in the morning. Long story short: Your pillow can be the number one reason you’re waking up with neck pain. When searching for the perfect pillow, you want to make sure it will fully support your head and neck. Pay attention to the pillow’s firmness, size, contour, and fill material. Take your time in finding a pillow that offers what you need — your neck will thank you! How can pillows help with neck pain? High-quality pillows are designed specifically to ensure that you get healthy, restful sleep. That means keeping your neck aligned with the rest of your body. Finding the right pillow to support your sleeping position will definitely help you prevent neck pain. For people who sleep on their backs, there are some pretty nifty pillows out there with indented head holders to ensure that your spine is comfortably aligned all the way through your back and neck. There are similar contoured designs for side sleepers and stomach sleepers. When it comes down to it, there’s a pillow out there for all of us — we just have to take the time to find it. Look for a pillow that is specifically intended for people with neck pain, like any of the 10 pillows on our ranking. Considering the wide variety of sleeping preferences, there is no such thing as the absolute best pillow on the market. But we did our darnedest to find one anyway. Through all of our research, we found a pillow that consumers loved. Critics adored it, and sleepers, well, slept well. That’s why we recommend the Ultra-Luxury Bamboo Pillow by Snuggle-Pedic as the best pillow for neck pain. This pillow does it all, whether you’re a side, stomach, or back sleeper. But there are tons of other great options out there, too — don’t miss our full list of the best pillows for neck pain. A great pillow isn’t the only thing that will help you sleep comfortably. Check out some of our other favorite products to improve your bedtime routine. Happy Ears Earplugs: These reusable ear plugs are perfect for helping you fall asleep no matter what’s going on around you. Blackout Curtains: Nothing is worse than trying to fall asleep while the sun is shining in your face. These blackout curtains will darken your room so you can get some well-deserved sleep. Melatonin Gummies: Made with natural ingredients like chamomile, lemon balm, and passionflower, these melatonin gummies are the perfect antidote to sleepless nights. Chew 2 and you’ll find yourself drifting off in no time. Aroma Diffuser: Essential oils are great for relaxing at bedtime. Try some chamomile or lavender right before bed. White and Color Ambiance Bulbs: If your sleep schedule doesn’t sync up with daylight hours, these light bulbs, designed to mimic sunrise and sunset, are exactly what your circadian rhythm needs.